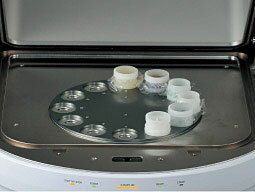 Accommodates all types of samples from small to large, from powders to liquids. Options include a vacuum measurement unit and helium purge unit for highly sensitive measurement of light elements and a 12-sample turret for automated continuous measurements. Select the irradiation chamber from four values to suit the sample size. 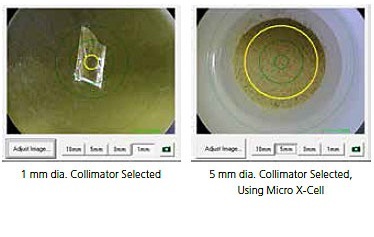 Select the most appropriate irradiation diameter for the sample shape: 1 mm diameter for trace foreign matter analysis or defect analysis; 3 mm or 5 mm diameter for small sample volumes. Use the sample observation camera to confirm the X-ray irradiation position on a specific position to measure small samples, samples comprising multiple areas, or when using a Micro X-Cell. Primary filters enhance detection sensitivity by reducing the continuous X-rays and the characteristic X-rays from the X-ray tube. 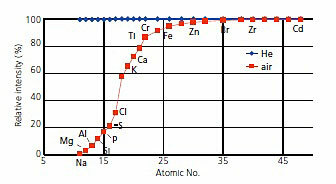 They are useful for the analysis of trace elements. The EDX-7000/8000 incorporate five primary filters as standard (six, including the open position), which can be automatically changed using the software. 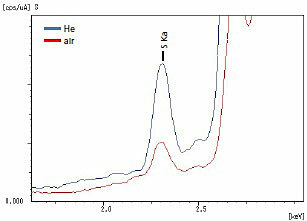 * This filter also cuts the background in the energy range shown in parentheses ( ). The collimators and primary filters are driven independently and can be combined to address specific requirements. Select the optimal combination from 24 (6 filters x 4 collimators) available options. 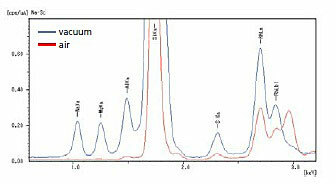 Quantitative analysis using the FP method is possible with all combinations. Sensitivity for light elements can be increased by removing atmosphere. Two options are available: a vacuum measurement unit and a helium purge unit. The helium purge unit is effective when measuring liquid samples and samples that generate a gas and cannot be measured in a vacuum. The addition of the turret allows automated continuous measurements. It improves throughput, especially for measurements in a vacuum or helium atmosphere.